Don't forget to sign the on-line petitions against the BRAI Bill and the Civil Liability for Nuclear Damage Bill. Find out more here. The Hindu ran a front page exclusive a week or so back, headlined: India stops U.S. attempt to sneak “scrutiny” into climate talks. It sounded pretty good. Unfortunately, the truth was not so impressive. But it was instructive. Let me explain. The Copenhagen fiasco basically set up a system where countries may voluntarily make commitments to do whatever they feel they can do. These commitments are non-binding, and the extent to which countries choose to honor them is not even open to international "scrutiny." They are, however, open to the more ambiguous-sounding "consultations and analysis." Recently, the US had tried to substitute the "s" word for the term "consultations and analysis".The US backed off when India's Environment Minister Ramesh shot off an email to American negotiator Todd Stern. But the real problem here is that this is all an act. The Americans want to look like they are getting tough on us. We want to look like we are getting tough on them. But nobody is likely to do very much because nobody has to! That's why I'm going to say something that a lot of people won't like: at the end of the day, if we want to get anything done, we'll all need to accept words even stronger than "scrutiny"-- words like "legally binding" and "enforceable." Of course, when it comes to carbon pollution, the US will have to cut much, much more, because they use much, much more--and they should pay for the share of historic pollution they've created. But at the very least, India will have to agree to reasonable cuts in emissions intensity (explained here). Here is my simple, two-part part argument for why only legally binding, enforceable agreemets will work if we want to cut pollution. You can sum it up with two words: horns and helmets. 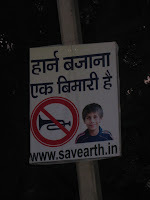 In Delhi, some people love horns, some people hate them. But we all hear a lot of them! 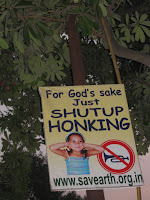 So an clever NGO has put together a great campaign of signs with slogans like these: "Shut Up Honking...Even dogs don't bark without a reason...Horn blowing is a sickness..." These signs are smart and funny and kids like them. There's only one problem. 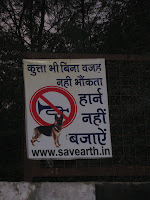 They don't seem to stop anyone from blowing their horn! Conclusion: clever things that are not legally binding are not likely to work--at least not very quickly. 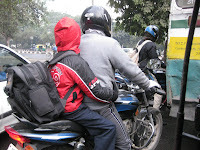 In Delhi, a very high percentage of motor cycle drivers wear helmets. I would like to tell you they wear them because they believe in the safety benefits of the helmets. But in most cases, this is not true. How do I know? Well, because I've talk to a lot of people. They say they wear a helmet to avoid being fined. As additional proof, I submit to you these photos which demonstrate that people who are not required to wear helmets, such as women and children riding as passengers, typically do not wear them! Now if the fathers and husbands riding these bikes believed in the life-saving properties of helmets, many of them would undoubtedly convince their wives and children to wear them. But they don't. Conclusion: people are more likely to change their behavior when they are required to by legally binding, enforceable laws. Summing up: legally binding, enforceable laws work, my friends! Cool signs do not! I think Indians as a bunch are deeply suspicious of any measure that mandates "good behavior". Whether it means queuing up, wearing helmets, not honking, or being punctual. I've said it before and I'll say it again - we need another 150 years to mature a bit. Not too large a time given the scheme of things after all! @Bhagwad:) If we've got 150 years, that will be good! Of course, India's share of the carbon pollution problem is fairly small, even in real terms. China's is bigger, but they are getting more efficient all the time--and much of the carbon they produce is really only a symptom of Western consumption. But everybody will have to do something if anything is going to get done, I suspect. How absolutely true, HB. Unless there are legally binding agreements and rules, no country is going to seriously stop polluting. Although it is completely ironic that the U.S., an environmentally irresponsible rogue state, wishes to play watchdog over climate agreements! @Sabitha, I find the Americans trying to play watchdog here both ironic AND deeply cynical...these guys know what they are doing! Grrr. @Bhagwad, I was thinking of your recent post on taxes today (http://www.bhagwad.com/blog/2010/politics/are-indians-finally-becoming-responsible.html) Maybe it won't take 150 years! But it will take a mix of laws and changes in how we look at the world. Don't want to suggest that laws alone will be enough; afterall, any law without sufficient support will be either ignored or repealed!